Got places to go? The ultra-compact GB Zuzu is the perfect travel companion for all of your glamorous adventures. This comfortable, yet striking lightweight stroller has a unique compact self-standing slide fold that's shorter than typical umbrella strollers so its super easy to tote and tuck away. Baby will comfortably take in the sights while relaxing in the posh reclining seat, and when necessary be easily shielded from unwanted spectators by the huge, extendable air-flow canopy. The large storage basket and compatibility with the most popular Graco and Chicco infant car seats ensures you'll be able to ferry baby from place to place virtually hassle free wherever your destination. The Zuzu travel companion is a lightweight system ready for all the adventures you have planned with your baby. I'm huge on walking/running at least 3 miles a day and with the Zuzu Stroller I have no worries about my daughter being uncomfortable! My favorite features are the Oversized canopy with ventilated window and the multi-position recline. My daughter dislikes the sun in her face, like most children but with the Zuzu all I have to do is recline her and open the Oversized canopy! And just like that all her complaining instantly STOPS! 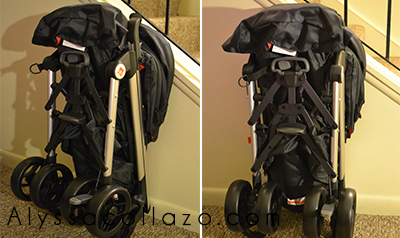 Another plus is the Zuzu Stroller is compatible with a handful of car seat - Graco Snugride Click Connect 30, Graco Snugride Click Connect 35, Graco Snugride Click Connect 40, Chicco Keyfit, and Chicco Keyfit 30. Additionally, the Zuzu includes 360° swivel wheels, a one-touch brake, and a weather-resistant shell. No more going to amusement parks with an oversize stroller! That's the best part. Before I had to worry about not over packing so the bulky stroller could fit into our medium sized trunk. Thanks to the Zuzu those worries are gone. I can pack extra for our amusement park trips. And I no longer have to struggle with the bulky stroller, I'm sure we can all relate to those days when you're in a rush and you have to take that bulky stroller out using one hand (since you're holding baby in the other) I definitely won't miss those days! Need I say more? GB products are sold exclusively at Babies “R” Us stores and BabiesRUs.com. Shopping online at Babies “R” Us was a breeze, and shipping was incredibly fast. 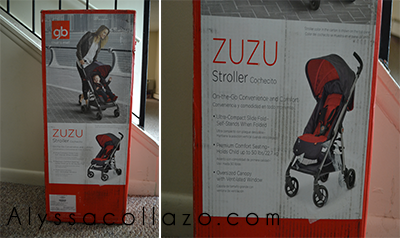 I literally got my Zuzu Stroller within 2 business days, which rarely happens when shopping online. Babies “R” Us definitely gets 5 stars for that! Be sure to follow GB on Facebook, Twitter, and Instagram! This is a very nice stroller! It'd be perfect for my niece. I especially like that it is not so big like many of the strollers out there! I love how lightweight and mobile this stroller is! Small and compact and yet a great amount of storage! Great review. What an awesome stroller. I would have loved that when my boys were little. What a nice little stroller. This seems like a wonderful product for parents who are always on the go! What a great stroller! I love that it's lightweight, foldable, and has that great canopy. What an awesome stroller! We've been looking into getting a new one. Will have to check this out. That's a great stroller. Seems perfect for parents of little ones. Outside of how wonderful that stroller is I love the color. It's actually rather stylish. This stroller sounds awesome. My babies are all starting to grow up, so I rarely use a stroller any more, but my sister is starting to have babies, so I will pass this review along. Looks so light weight. I need a stroller that stores small. I am not familiar with this brand but it looks nice and lightweight and folds up nicely. We're finally at the point where we're ready to move from our mega-stroller (which I love, but is simply too big to be practical in many places) to something more compact. 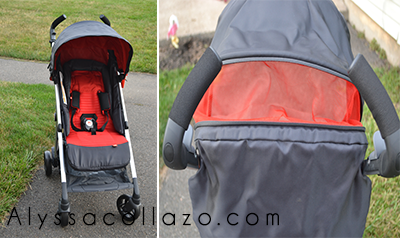 Thanks for the review; this particular stroller looks extremely sturdy and might be just what we're looking for. I don't have children but I like the fact that this is compact and stylish! I like the large basket underneath. Nice looking stroller. They sure have come a long way, since I had my baby. That is a great looking stroller. I love how compact it is when you fold it. This looks great. I have a Dodge Journey and my sit and stand stroller doesn't fit in the back unless I take off the umbrella attachments. Strollers can definitely be too big for the trunk space. The stroller looks nice. I like strollers that are not bulky and can be folded using one hand. Oh wow that is a nice stroller!! :) I love the colors. Ours was grey and purple for the youngest and it stained easily because of the light colors but this looks like it would be easy to clean too. a stroller is a must in any mum's arsenal. this looks like a good brand of stroller and looks sturdy enough to last until your child is a few years older. What a cute stroller we have 3 but I'm not really happy with them and the one I want is a bit to expensive this one looks great and is not going to send me in to banrupt. Nice stroller, my daughter is due in September so I am on the look out for a ll things baby and toddler. Our strollers we had when my kids were little had zero bells and whistles. Thanks for sharing a really great review! We are looking for a new stroller and ZuZu sounds like perfect option! Have to check it out! It looks like an amazing stroller! I will have to look into it! That's a nice stroller and looks to be very comfortable. It would make my toddler jealous for sure! You're right, there are some places where it's hard to have a full-sized stroller. An amusement park is def. one of them! This stroller looks really nice! This sounds like a great stroller. I will have to share this with my niece and my sister. Thanks for sharing. This is what I need for my 1 year old. He loves it when I take him out for a walk. This looks strong and a good quality. I love the color combos! Looks very sturdy and durable too! That thing is da bomb! Wish I was having another baby just so I could get one! Great review! I had a similar stroller for my son when he was little. I love the fact that it can be folded up like that. This is a really great stroller!! I don't have a little one anymore but my sister does will recommend this to her. Wow, this looks like a really nice stroller! This would make an awesome gift for a new mom! This sounds like a really great stroller! I was stupid and bough a cheap one when my son was little. It was pure suffering try to go somewhere with it. Always buy quality! What a great stroller. I'll share your review with my niece. Looks like a great stroller, we don't use them that often. If we do we have a little simple one other than that, the kids are always walking or we wear the littlest one in a carrier. This looks like an amazing stroller, I wish I had this when I had my daughter.